A total of 329 properties sold in the Victoria Real Estate Board region this January, 23.7 per cent fewer than the 431 properties sold in January 2018 and a 12.3 per cent decrease from December 2018. Sales of condominiums were down 5.9 per cent from January 2018 with 111 units sold but were up from December 2018 by 7.8 per cent. Sales of single family homes were down 29.3 per cent from January 2018 with 152 sold. 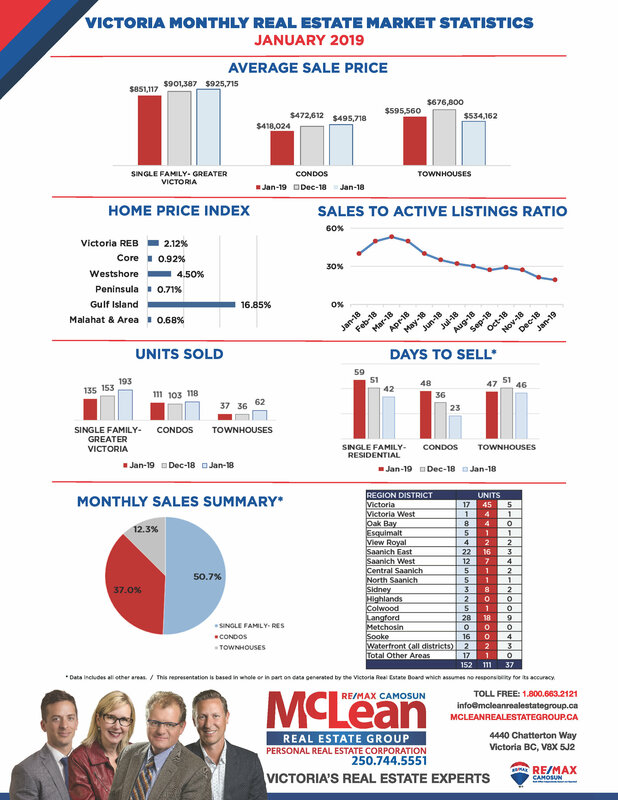 There were 2,057 active listings for sale on the Victoria Real Estate Board Multiple Listing Service® at the end of January 2019, an increase of 3.5 per cent compared to the month of December and a 38 per cent increase from the 1,491 active listings for sale at the end of January 2018. The Multiple Listing Service® Home Price Index benchmark value for a single family home in the Victoria Core in January 2018 was $840,100. The benchmark value for the same home in January 2019 increased by 0.9 per cent to $847,800, lower than December's value of $858,600. The MLS® HPI benchmark value for a condominium in the Victoria Core area in January 2018 was $471,300, while the benchmark value for the same condominium in January 2019 increased by 6 per cent to $499,700, slightly lower than December's value of $502,400.